Starting Indoors: Sow indoors in pots about 6-8 weeks before planting out. Keep at 35-40°F for 10 days, then at 60-70°F. Provide moist conditions by placing some plastic wrap over the containers until germination occurs. Starting Outdoors: Direct sow in spring. Large saucers of gently pleated petals reveal a contrasting halo of purple at their centers. 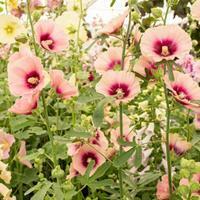 Its shorter height and multi-branching habit invites it into smaller gardens where it will bloom for months! Rust resistant, however best practice is to allow plenty of air circulation around each plant. 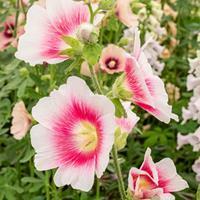 Cut back after flowering and avoid soggy soils to encourage its perennial tendencies. Self sows. Fertilizer: Incorporate a 1" layer of compost annually. Diseases & Pests: Avoid fungal rust problems by spacing plants properly and planting them in a location that receives good air flow. If hollyhock rust has ever been a problem spray with organic fungicide preventively throughout the season or plant in a new location. If slugs are troublesome to new seedlings sprinkle some diatomaceous earth or iron phosphate pellets on the ground around the plants. Plant: Tall stems with lobed, somewhat rough green leaves. Flowering: Deep pinksaucer-shaped flowers have purple centers and appear along the stems, blooming from the bottom to the top in succession. Seeds: Flowers will turn into oval brown seed pods containing the seeds in a compact ring; self-sows. 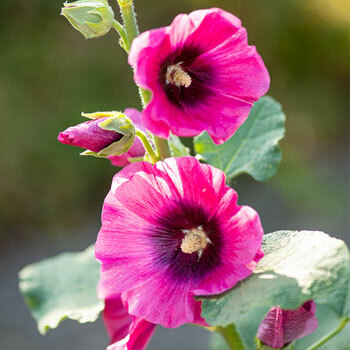 The genus name Alcea is Latin for the Greek word alkaia, for a type of mallow.